What can I say? There are lots of versions of Rocky Road and all are some version of melted chocolate with a various things stirred into the chocolate and then set. With the alcohol this is definitely for the grown ups and a truly delicious treat for the chocoholic. I usually make a double quantity - it is that popular. I have taken this to plenty of events and it is always eaten. 2-3 squares of Turkish Delight, orange if you can get it but pink/rose flavour is ok.
Line a small slice tin with cooking parchment/Gladbake. Optional - toast the pistachios. It is not necessary. Cut cherries in half. 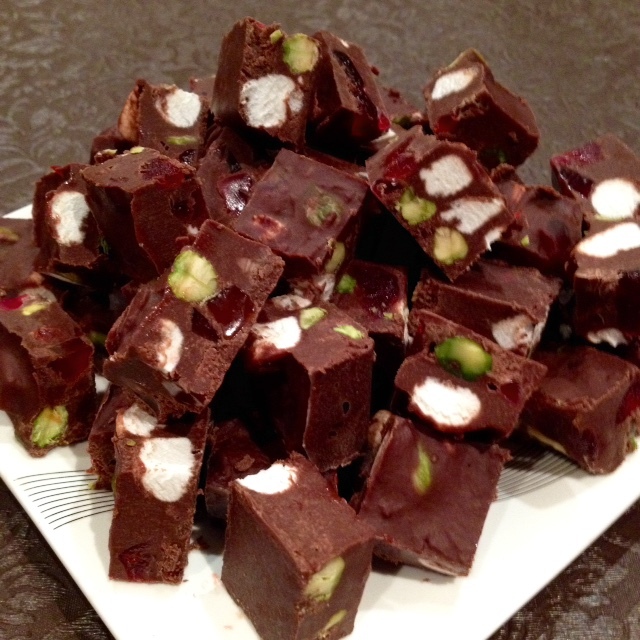 Cut marshmallows and Turkish Delight into pieces about the same size as the cherry halves. Break chocolate into small pieces and put into heatproof /microwave bowl. Melt the chocolate over hot water or in microwave on medium heat in 1 minute bursts. Add all ingredients to melted chocolate, mix well. Press into slice tin. It may not be enough to fill the tin so push it into 3/4 of the tin. Cover with another small piece of the cooking parchment. Press firmly and smooth. Put in fridge to set.